In 610 A.D. the prophet Muhammad began to receive a series of revelations that would become the foundation of the faith of Islam. Renowned for his piety and wisdom, for the remainder of his life Muhammad spread his message to the Arabs. By the time of his death in 632, virtually every tribe in the Arabian Peninsula had enlisted under the banners of Islam and given their allegiance to its prophet. 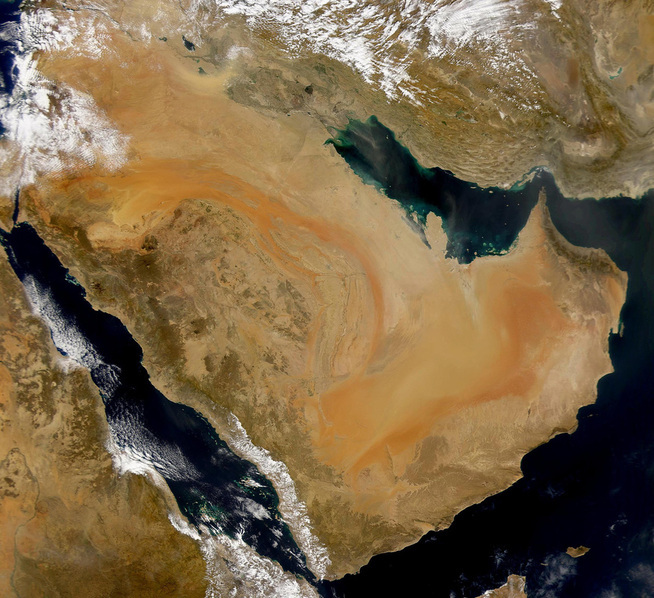 The Arabian Peninsula—a vast plain of deserts and small mountains—lies across the Red Sea from the northeastern coast of Africa. It stretches about 1,400 miles from the Syrian Desert in the north to the Arabian Sea in the south and about 1,200 miles from the Red Sea on the west to the Persian Gulf on the east. While the majority of the peninsula is desert, the southwest corner, known as Yemen, has fertile mountain lands and good ports. Agriculture and trade in the southwest. As early as the twelfth century B.C. people in Yemen created wealthy kingdoms based on agriculture and trade. They built great dams and irrigation networks to grow wheat and other crops. The Yemeni also extracted tree sap to get frankincense and myrrh, resins used for incense. Traders grew wealthy exporting myrrh, frankincense, and spices such as cinnamon, all of which were highly prized and extremely valuable in the markets of Africa, Southwest Asia, and Europe. Over time, thanks to their strategic position on both the sea and land trading routes that linked the Mediterranean region with the Indian Ocean, the merchants and rulers of Yemen also came to control the trade in spices and silks between Asia, India, and the Mediterranean. As trade made them fabulously wealthy, it also made them targets for more powerful states. The country was invaded at various times by Ethiopians, Romans, Persians, and Byzantines. Both trade and conquest exposed Yemen to many new ideas and cultures. It became home to many religions, each with its own temples and priests. These influences made Yemen a center of great cultural diversity from which new ideas spread along the trade routes. Oases, towns, and deserts. In much of the rest of the peninsula, the merciless glare of the desert sun and the lack of water prevented people from growing crops. In this harsh environment, most people survived by herding animals. Called Bedouin, they lived in tents and moved from place to place, herding sheep, goats, and camels. Since struggle over water rights and livestock was a way of life in the harsh conditions of the desert, the Bedouin were mobile, armed, and used to fighting. Some Bedouin settled in oases, shady areas with water sources, where they could grow crops such as grain and dates. In some oases, especially along trade routes, towns sprang up. The northwestern Arabian town of Yathrib, for example, was located in an oasis with fertile soil that produced large date crops. Within the oasis lived farmers and herders. In the town lived merchants and craftsmen serving the caravan trade between Yemen and the Mediterranean. Some Bedouin came to depend entirely on the caravan trade for their living. South of Yathrib, in a rocky valley about 30 miles from the Red Sea, local Bedouins and immigrants from Yemen turned the town of Mecca into a major caravan center. Although Mecca had not been built in a fertile oasis, it was located near the intersection of two trade routes and controlled the well of Zamzam. It was also the site of an area that many surrounding peoples believed to be sacred. Meccans lived by supplying the caravan trade and the pilgrims who came to pray at the sacred site. Relations between the nomadic Bedouin and the people of the towns and oases could be uneasy-- the nomads were likely to raid both. Often, however, merchants and Bedouin would reach an agreement. Merchants would pay for "protection" and market the Bedouin’s fine leather goods, rugs, and woven cloth. Bedouin culture influenced the political and social organization of Arabia. Like the Bedouin, all Arabs organized themselves into clans and tribes. They cherished family relationships because people depended on families for survival. "Take for thy brother whom thou wilt in the days of peace," went one Arab verse, "But know that when fighting comes thy kinsman alone is near." Arab society was also paternalistic. Fathers made important decisions within the family and took part in politics. Male clan leaders advised the shaikh, the leader of the tribe, but all the men of the tribe often made major decisions in a kind of tribal democracy. Women rarely took part in politics although their advice was often sought on important community issues. Women's primary role was that of mother. They also contributed to the group through such activities as spinning and weaving. Although Arab society was paternalistic, women had considerable freedom. In towns they could own property and businesses. In the desert, some tribes allowed women to have more than one husband, just as men could have more than one wife. Arab values reflected their struggle for survival in a harsh environment. They prized above all loyalty, honor, courage and generosity. Arab leaders displayed loyalty and generosity by giving feasts and presents to their followers. For poorer members of society, such generosity in times of want could mean the difference between life and death. Hospitality to guests was also a matter of honor and sacred obligation. As Arabs settled down in the relative security of towns and oases, tightly knit tribal organization became less essential for survival. Tribal loyalties began to give way to those of immediate family and clan. Growing wealth and the accumulation of private property that was part of merchant life also caused changes. Inheritance disputes could cause conflict within families. As clans vied for power, tribal loyalties were often forgotten. In Mecca, for example, strife among the different clans of the ruling Quraish tribe became particularly intense in the last half of the sixth century. The Umayyad clan displaced others as its members sought to control trade and town government. Such rivalry, however, increased people's sense of insecurity. As they struggled to recover a sense of personal security, new ideas began to circulate. In 613, Muhammad, a member of a relatively poor clan of the ruling tribe, began to preach an especially powerful set of new ideas in Mecca. Muhammad had been born in Mecca around 570. His early life was not easy. His merchant father died before he was born, and his mother died when he was six. His grandfather, and an uncle, Abu Talib, raised him. As a young man, Muhammad became the manager of a caravan business owned by Khadija, a wealthy widow. At the age of 25, he married Khadija, who was 15 years older. They had three sons and four daughters, but experienced tragedy as all but one daughter, Fatima, died young. In his early years, Muhammad may have practiced the religious traditions of his city. Although some wandering Arab holy men had already begun to preach the existence of only one god, most people in Arabia were polytheists. They worshipped their gods and goddesses at special shrines. One of the most important shrines, the Kaaba, was in Mecca. Many people journeyed there every year, even setting aside blood feuds to trade and worship. As a caravan manager traveling the trade routes, Muhammad also probably became familiar with Jewish and Christian ideas. Perhaps around the campfires at night, with the stars shining brilliantly above in the desert sky, Muhammad heard Jewish and Christian merchants telling stories from the Torah and the Gospels. Created man of a blood-clot. After arguing a bit with the voice, which identified itself as the angel Gabriel, Muhammad agreed to carry the message to others. Over the next twenty-two years, he received many more revelations, which became the Qur'an, the holy book of Islam. Muhammad's message. Muhammad's earliest revelations contained two simple messages. First, there was only one God: "Say God is One; God the Eternal: He did not beget and is not begotten, and no one is equal to Him." Second, those who accepted God's message must obey his will. In doing so they formed a special community, the umma, in which all believers were equals. They must look out for each other, especially the weak or needy. To the Arabs who worshiped many gods, Muhammad's message was radical. Although called Allah, the name of one of the Arabs' most important gods, Muhammad 's God was the God of the Christians and Jews. Muhammad believed that just as God had sent his divine message to humanity through prophets, including Abraham and Jesus, God was sending new revelations through him. The flight from Mecca. As Muhammad preached these revolutionary ideas of social equality and monotheism, the merchant rulers of Mecca became alarmed. Muhammad’s claim that all the faithful belonged to a single Islamic community seemed to threaten tribal and clan authority. His rejection of polytheism also seemed a threat to those who profited from the annual pilgrimages to the Ka`ba. The rulers of Mecca soon began to harass the prophet and his small band of followers. Meanwhile, however, Muhammad's reputation for both piety and justice spread beyond Mecca. Nearly 10 years after he had begun preaching in Mecca, a delegation of tribesmen from Yathrib asked him to settle in their city and serve as a kind of arbitrator or referee among the feuding tribes of the oasis. With the Meccan leaders growing increasingly hostile to the umma, in 622, Muhammad accepted the offer and traveled to Yathrib with many of his followers. This journey became known in Islamic history as the hijra, the flight, or migration. Muhammad's arrival in Yathrib marked an important milestone in Islamic history. In Yathrib, he governed as both a spiritual and a political leader. Yathrib itself was renamed Medina, or City of the Prophet. Later, Muslims marked the year of the hijra as the beginning of the Islamic calendar. In Mecca, Muhammad had emphasized that he was continuing the tradition of Jewish and Christian prophecy. When Jewish tribes in Medina refused to acknowledge him as a prophet, however, he moved away from Jewish and Christian practices. Instead of facing their holy city of Jerusalem while praying, for example, in Medina a new revelation commanded the Muslims to face Mecca and the Kaaba instead. From Medina, Muhammad began to convert the desert tribes. With their help, the Muslims also began to raid the Meccans’ caravans. In 630, after several years of warfare, Mecca gave in and opened its gates to the prophet. The Meccans too now accepted the new faith. Muhammad destroyed the pagan idols in the Kaaba so that Muslims could make the pilgrimage to worship God there as commanded by the revelations. After this victory, most of the Arabian tribes acknowledged Muhammad's leadership and the power of Islam. When he died in 632 at his home in Medina, the Prophet had laid the groundwork for a new religion that would soon spread from Arabia to the rest of the world.